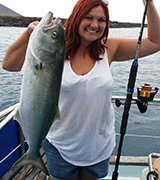 We offer a variety of ʻGenuineʻ fishing excursions from a half day 4 hour, or a full day 7 hour trip. On all trips we do a mixture of Game Fish Trolling & Bottom Fishing, approximately half time trolling and half time bottom fishing, depending on what is fishing the best at the time, we use a variety of artificial and dead bait lures on best quality PENN and SHIMANO tackle when trolling for Tunas, Marlin, Wahoo, Dorado, Amberjacks, Barracuda etc, depending on what is in season at the time. The bottom fishing we sometimes do ‘Drift Fishingʻ but mostly at anchor, over a specific mark, either the edge of a shelf, or on a line of rock and sand or basically anywhere we see fish showing up on the fish finder screen, and using a deep drop chum pot to attract the fish directly under the boat, it is very precise and effective. We use a mixture of baits, whole dead or live fish on the heavy tackle for Big bottom feeding Flatfish, Snappers, Morays, Amberjacks etc and any big sea bed scavenger species that often take a big bait. Also we use lighter tackle for small to medium fish, and catch the live baits for the big rods, like Mackerel,Boga, Herring etc and other good eating fish like Snapper, Sea Bream, Amberjacks, Sea Perch, Trigger fish etc using baited hooks, jigs, feathers, artificial soft baits, just off the sea bed bottom. We practice ‘Catch & Release’ on most fish and any protected species accidentally caught are returned back to the water alive, all Game Billfish like Blue Marlin, White Marlin & Spearfish are always released. 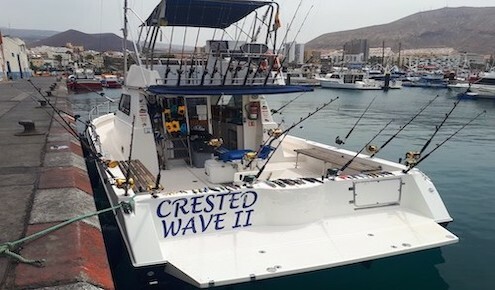 We also offer ‘Private Charters’ and ‘Specialist trips’ at discounted prices where you can decide want you want to target, we will always advise you as to what is fishing best at the time, as we also want a productive trip. The British owners of the boat and their crew are all fishing enthusiasts with many years experience who know these waters like the back of their hand. We cater for the serious fishermen and are also very willing to teach the novice, set up all the tackle and bait and give any advice and help if needed. 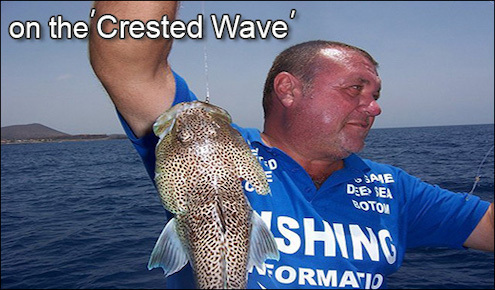 Run by Father & Son, Mick and Jack, the Crested Wave has a very well known and respected reputation as a Genuine Fishing excursion. 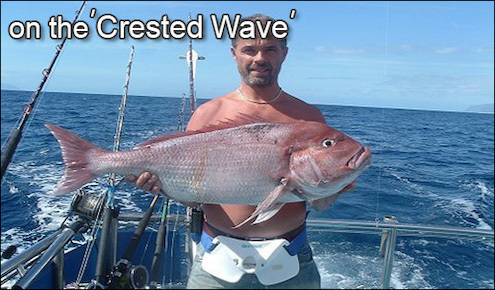 If you are an experienced fisherman you will know nothing is guaranteed when it comes to fishing, but believe us, no boat crew tries harder than the Crested Wave team. 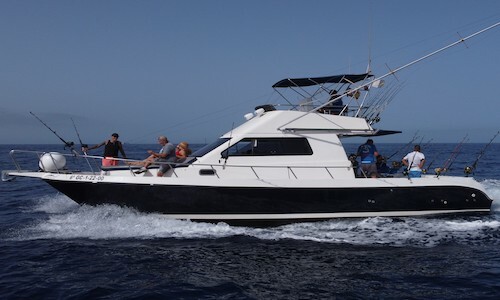 We do guarantee you will be very well looked after by the 3 of us, and pride ourselves on our customer service, that is why we are in the top of the reviews and have many regular repeat customers, and is probably the most well known fishing charter boat in Tenerife. Everything is included in the price, no hidden charges! All equipment, tackle, 2 rods each, bait, cold soft drinks, water and beers (food on the 7 hour trip). Full toilet facilities and shade around the whole boat if required. Reservations are normally necessary a few days in advance, but you can always check with us at short notice in case of any cancellations. Full Days Fishing: – 7 hours. Half Days Fishing: – 4 hours. 7 hours (10:30 – 17:30) – departing from Los Cristianos harbour. 4 hours (09:00 to 13:00 & 13:30 to 17:30) – Los Cristianos harbour. Price depends on availability and what you want to do i.e. 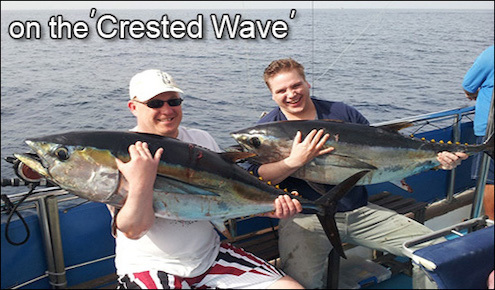 half day or full day, just Big Game fishing for Marlin or Tuna, Jig fishing, just bottom fishing, sharking or a mixture of styles, it’s up to you, but we will always advise you on what type of fishing is producing the best catches at that time. Legends live Cruise .7 nights all inclusive, canary islands 24th march 2019.